This exquisite set of grinders, black wood with stainless caps, utilize the case hardened steel, two-stage, helix-shaped, double row of teeth, that give you a perfect grind. 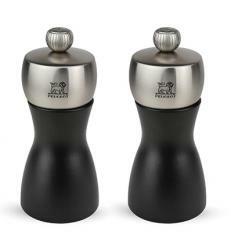 Naturally the grind is adjustable, from fine to coarse. 4 ¾” ea.